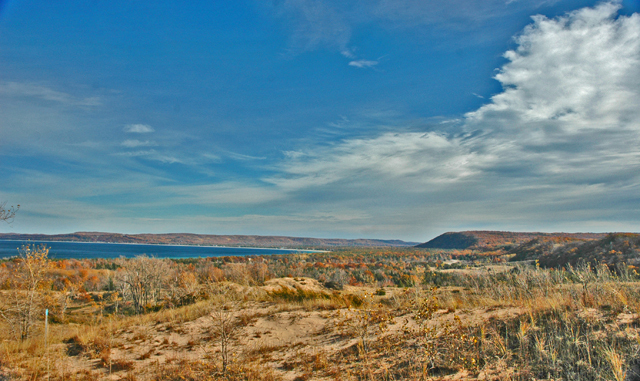 Looking north over Sleeping Bear Bay. I’ve been out on the Dunes on windless days in summer (and I can’t say I’ve enjoyed the experience) but it’s a rare day when you won’t feel a decent breeze as you’re trekking along the knife-edge between sand and sky. After all, it’s the wind that created this restless landscape, and it’s the wind that constantly rearranges and reshapes it according to its own inscrutable rules and rhythms. Last week I was wandering one of my favorite trails (at Sleeping Bear Point) with New York travel blogger Britany Robinson , and for some reason it was the wind that kept inserting itself into my thoughts. Blame November, this season of bleak beauty, when Nature is stripped bare of all ornament, naked as a dune under the unforgiving sky. 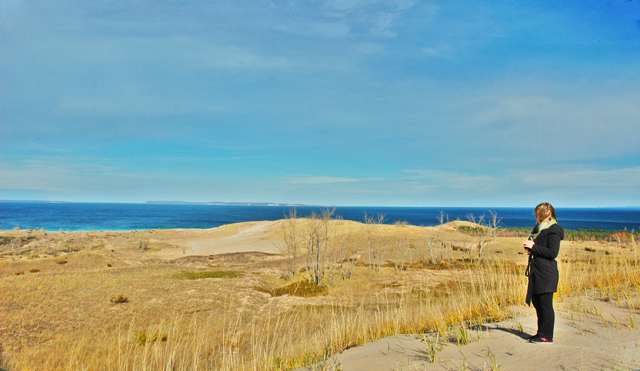 Most people who use the Sleeping Bear Point Trail just charge right out onto the Dunes, but if you fight that impulse and use the small trailhead off to the side it will allow this fantastic place to reveal itself in a slow dramatic crescendo. It starts in a cozy, pint-sized forest of short jackpines and firs, and climbs gradually through a higher, drier region of beeches and maples until the last steep push upward, where the soil gradually turns sandy and the woods give way to open grassland with scattered clumps of cottonwood and juniper. Suddenly you turn around and discover that you’re standing in the sky. And there’s the wind. Waiting for you. Not a particularly strong, cold wind this time -- kind of balmy for November, in fact. But once you notice something, even a small thing, you can’t seem to stop noticing it. That wind. Rattling the stiff autumn leaves of the cottonwoods like little golden paddles and breaking them free to scamper, one by one, across the sky. Skittering across the sand like a snake, leaving ripples in its wake, and brushing the face of the dunes in a fine, stinging mist. Whispering through the yellowing beach grass and shaking the dry husks of Pitcher’s thistle, playing the cracks and holes in ancient long-dead cedars like giant flutes. Bending the branches of the high hardwoods and rubbing them against each other until they squawked like badly-played violins. Raising the waves on the distant shore into massive milky-green combers that crashed and thundered onto the beach below, and silently rearranging the clouds into spirals and swirls of deepest blue and smoky white. But the odd thing was that these were things all noticed most sharply in their absence. Descending into the deep slacks between dunes, we entered a region of temporary silence, so complete that it made your ears ring, broken only by the appearance of a flock of juncos that zoomed through the air like little white-bellied fighter planes. 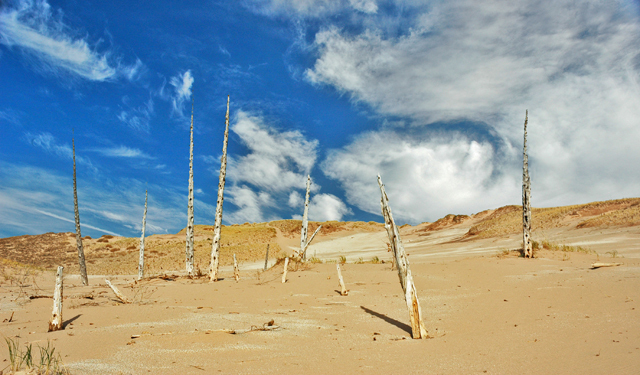 In one of these deep spots is a curious and eerie reminder of the wind&apos;s power in this place -- a ghost forest. At the bottom of a wide bowl are strange, eldritch spires of cedar: ancient trees that were smothered by sand long ago as the dunes advanced, then uncovered years later as they moved on. Thanks to the wind, the dunes are constantly on the march. In 1931 the nearby Life Saving Station had to be hauled to its present-day location because it was in danger of being buried. Who has seen the wind? Neither I nor you; But when the leaves hang trembling, The wind is passing through. Who has seen the wind? 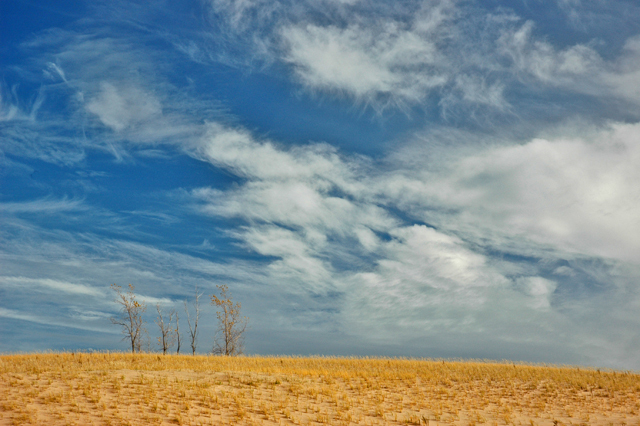 Neither you nor I; But when the trees bow down their heads, The wind is passing by. I think I even remember the melody that goes with it. Which means it’ll be stuck in my head all week. 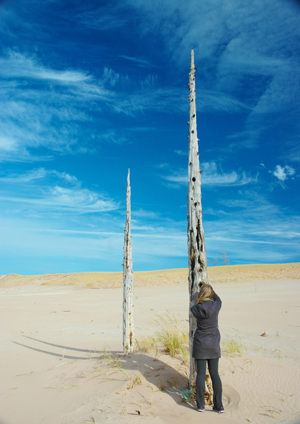 November at Sleeping Bear: dune grass, cottonwoods and clouds.